J. M. Sarria-Toro, C. García-Morales, M. Raducan, E. S. Smirnova, A. M. Echavarren. GO TO OPEN ACCESS Angew. Chem., Intl. Ed. 2017, DOI: 10.1002/ange.201611705. 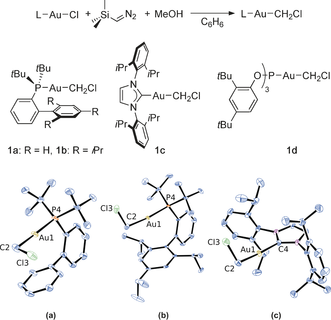 Chloromethylgold(I) complexes of phosphine, phosphite, and N-heterocyclic carbene ligands are easily synthesized by reaction of trimethylsilyldiazomethane with the corresponding gold chloride precursors. Activation of these gold(I) carbenoids with a variety of chloride scavengers promotes reactivity typical of metallocarbenes in solution, namely homocoupling to ethylene, olefin cyclopropanation, and Buchner ring expansion of benzene.